Having attended a country fair at Lampeter last weekend (see last post) this weekend I went to the similar Figgat Fair in Grantown-on-Spey, which is run by the excellent Grantown Museum and Heritage Trust. Again there were craft, food and second-hand goods stalls spread out over a grassy area and again the weather was perfect with sunshine, blue sky and fluffy white skies. At both events big brands and logos were thankfully absent. These were markets in the traditional sense where local trades people, artisans and craft workers could display their wares. Also in Grantown at the same time as the Figgat Fair was the Cairngorm Farmers Market, which is held in various parts of Strathspey some summer weekends. Oddly on this occasion there were more crafts than food stalls at the Farmers Market. Wandering round the stalls in the sunshine has a completely different feel to wandering round a shopping centre with a relaxed and slow ambience totally absent in the latter places. Of course it would be different in heavy rain! The Figgat Fair is a traditional event. “Figgat” appears to come from the Norse for “cow road”, “gate” being the Norse for “road”, suggesting it too began as some form of farmers market. Last weekend I made the long journey back to the university I attended in the far off past, having been invited by the Lampeter Society to give their annual after dinner talk. Now in the 40 years since I’d left St David’s University College (currently called Trinity St David) I’d had little to do with the place or the little town of Lampeter in mid-Wales in which it is situated. Indeed, I was surprised to discover that as a graduate of the college I was automatically a member of the Lampeter Society and had been all those years. Deciding it would be interesting to finally go back (and I must admit a little flattered to be asked) I accepted the invitation and then, months later, discovered that reaching Lampeter had not become any easier. Door to door it was a twelve hour journey – ten hours on three trains – Aviemore to Edinburgh to Wolverhampton to Aberystwyth - sandwiched by two one hour car journeys. On the final taxi journey to Lampeter I watched the soft, rolling green hills, dotted with little woods and thick hedges. I had forgotten how lush this landscape was in summer, how quietly beautiful. My brief stay in Lampeter was both strange and familiar, a peculiar feeling. There were big changes of course – student numbers have grown from 340 to over 2000 so there were many more buildings. The central Old Building still looked the same though and I could just find my way about. The town was the same, bustling with shops I’d never seen before yet amongst them ones I remembered. I even had breakfast in Conti’s Café, just as I used to after sleeping in and missing breakfast, a regular occurrence in my student days. And on my first evening I joined others, most of whom I hadn’t seen since I left, in the Black Lion, where we used to drink regularly. Sitting with friends from the past over a pint again part of me felt as though it had only been a few weeks since I’d been there with them whilst another knew that it was decades. There was a local Food Fair in the college grounds the day I was there, busy with stalls and people. The sun shone and the air had an almost dreamlike brightness and clarity, adding to my feeling of unreality. (A friend from the past punctured this a little by saying that all he remembered of the weather was that it was always raining). A highlight of the fair was when a local music group, mostly playing rock and pop standards, broke into the familiar opening chords of Muddy Water’s Hoochie Coochie Man and then sang it in Welsh. That was a first for me – Chicago Blues in Welsh. While at Lampeter I used to wander the local fields, woods and hills, usually on short half-day walks. One particular joy was to wander beside the placid River Teifi, which meandered through the landscape. Strolling down to the river again I found it hadn’t changed much, if at all, though the town had encroached almost to its banks. The sense of serenity and quiet beauty was still there; the gentle waterway slipping through countryside that seemed unchanging. At the dinner I showed images of my home hills, the Cairngorms, and of my hike along the Pacific Northwest Trail and of igloo trips in the Rocky Mountains with Igloo Ed. I don’t think they’d had a talk like that before! Then it was the twelve hour journey home, feeling a little changed and contemplative after reconnecting with another time and place. The latest issue of TGO (September) is in the shops now. My gear pieces are a review of sixteen trail shoes and a test report on the Litehouse Solo tent. In my backpacking column, entitled Hike Your Own Hike, I have a bit of rant at those claiming moral superiority for ultralight hiking. Elsewhere in the Hill Skills section I describe how to pack a large pack, illustrated with a series of photos that were taken on a calm day with many midges! I also contribute, along with others, to a feature on planning your own long distance route. And to show you the result of doing this there's a piece by John Williams on an alternative to Wainright's Coast-to-Coast route. Elsewhere in the magazine Roger Smith has a go at the ugly Trailblaze boxes that have been appearing on National Trails; Cameron McNeish considers our relationship with the landscape and goes for a walk in the Carneddau in Snowdonia; Carey Davies tries paragliding and walks up Ingleborough by a route I remember as one of the best in the Yorkshire Dales; Ed Byrne tries scrambling on Tryfan; Paddy Dillon explores Sardinia, an island I remember looking at from Corsica and wondering if it was worth a visit - Paddy has convinced me it is; Edoardo Albert looks at archaeological walks in Northumberland and Dave McFadzean laments the damage being done to the Galloway Hills by quad and trials bikes. In his outdoor books column Jim Perrin praises Peter Matthiessen's wonderful The Snow Leopard, which I last read on a trek in the region the book describes. Visually the outstanding feature is a photo essay called Nature of Scotland by leading wildlife photographer Laurie Campbell, which has superb pictures of squirrels, eagles, frogspawn, sundew and much more. In Hill Skills there is advice on avoiding navigational mistakes plus tips on bushcraft, choosing a tripod, heat exhaustion, dealing with blisters and much more. In gear as well as my pieces Judy Armstrong reviews 15 women's waterproof jackets. And right at the back of the magazine is arguably the most important feature of all - a piece by mountaineer Doug Scott on his work for Community Action Nepal, a charity dedicated to helping mountain people in Nepal to help themselves. The pictures shows the view from the Litehouse Solo tent during testing in the Cairngorms. Kickstarter is an interesting concept whereby someone can raise funds for a project by pitching it to supporters for finance. Devin Montgomery did this for his innovative and original Boilerwerks chimney kettle. Now Devin is helping Hendrik Morkel of the excellent Hiking in Finland blog who is http://www.blogger.com/img/blank.gifasking for support for his project for the Ultralight A-Z - A Video Guide To Lightweight Backpacking. He's already met his target of $6000 but more funds would mean a better product. Hendrik's contribution to the backpacking community is already great (check out his blog for some interesting interviews with gear designers)and this project deserves support. The video will appear online for free but there will be various items including HD downloads, DVDs and T-shirts for supporters depending on how much money they pledge. Back from the OutDoor show in Friedrichshafen after four days of trains, planes, cars, ferries, airports, stations, exhibition halls, hot hotel rooms, bright lights and no actual outdoors it's time to take stock. Shows like this are much more tiring than a long walk in the hills, both because of the travelling (longest section - home to Edinburgh Airport! )and the non-stop round of stands and the barrage of new gear and marketing. Of course the show is also very interesting and I did see some good-looking stuff including stoves, packs, shoes and mats. Updates on all these are still appearing on the TGO website (scroll down to Gear News). I'll be writing an overview of the show and the new gear for the October issue of TGO too. Home again my first desire was fresh air and the natural world, away from artificial lights and constant noise. The green world looked very appealing despite the swirling clouds and heavy showers. In fact as I wandered through my local woods and fields it was the sky that dominated the landscape with huge clouds piled one above the other rising to the heavens. Insubstantial and mobile the skyscape changed constantly, white clouds giving way to black, rain slanting fiercely down then shafts of sunshine lighting trees and patches of hillside. The warmth of July and the wetness of the weather meant rich greeness everywhere. The light freshness of spring is gone. Now the dominant colour is the deep green of summer. Close up there was much colour amongst the green though - a mass of flowers in the meadows and marshes - tormentil, eyebright, orchids, ragged robin, viper's bugloss, thistles - yellow, white, pink, purple. Sunshine may be missing but the summer is still full of vitality and interest. My first photo book has just been published by Frances Lincoln. A Year In The Cairngorms has 120 colour photographs portraying the Cairngorm mountains in every season. 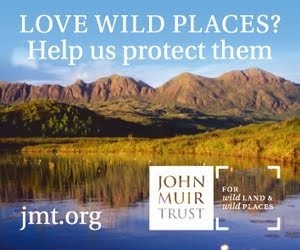 Having lived on the edge of the Cairngorms for over 20 years these are my local hills and one of my favourite wild areas. The book has already had a good review on My Outdoors. 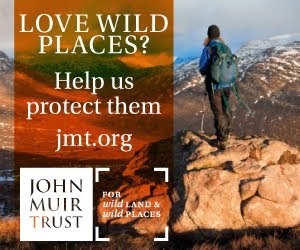 The reviewer comments that the pictures shows the Cairngorms as they are and not as they might look in those of a landscape photographer who spends hours waiting to take the perfect photograph. This is very much what I have tried to do. Taking my inspiration from the late Galen Rowell (whose Mountain Light is arguably still the best book on outdoor photography), my photography reflects days moving through and living in the mountains and my pictures are taken in all weather conditions. The reviewer also notes that there's no technical info on "camera and film speed". Well, for those interested all the images are digital so film doesn't come into it and all were shot as raw files and then processed in Lightroom software. The cameras were Canon 300D, 350D and 450D DSLRs with 11-18, 18-55 and 55-250 lenses (mostly the 18-55, a great portable lens) plus a couple from the Sigma DP1 compact. Update: Andy Howell has now reviewed the book on his website Must Be This Way. 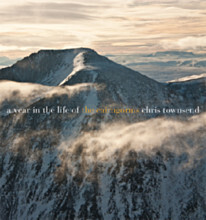 Like My Outdoors Andy Howell praises the book for photographs that show the Cairngorms as they are. Thanks Andy! Update 2: Good review on Outdoors Magic with some sample images. Further updates. Roger Cox in the Scotsman Magazine gave an excellent review, describing my photographs as "majestic". 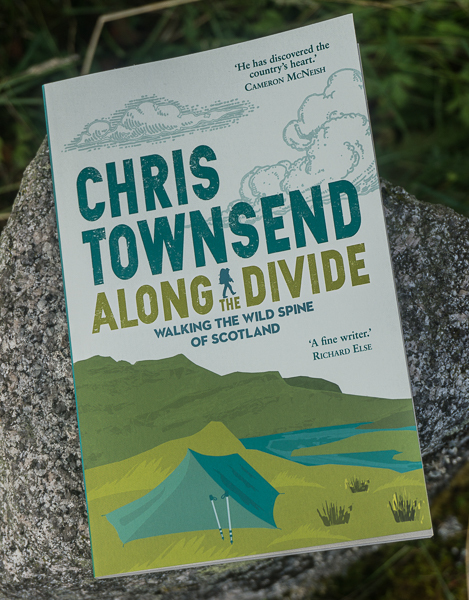 On Undiscovered Scotland the reviewer describes the book as "abosolutely stunning". In the Aberdeen Press and Journal Morag Lindsay made it Book of the Week says the book is "a splendid celebration" of the region. There was also a long piece in the Dundee Courier Weekend section for August 27 with several pictures from the book and an interview with me. I can't find this online! Overall I'm delighted with the reception the book has received. Descent into Zurich airport in a storm. Ground barely visible until we touched down. Rain torrential. 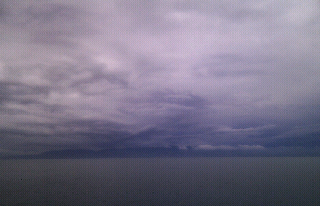 Cleared for ferry across Lake Constance but sky full of threatening clouds. Then more downpours and thunder in the evening. And it was sunny in Edinburgh! Tomorrow the show begins. Two days. Over 890 exhibitors. If I see 50 I'll be pleased. In a few days I'm off to the huge OutDoor Show in Friedrichshafen to see all the new gear and try and pick out anything interesting. I'll be at the show for TGO magazine, and, all being well with the technology, reports should appear on the TGO website during the show. Then there'll be a detailed account in the October issue. I might post some less gear-orientated stuff about the show here as well. Rain, Rain & Rain. With Some Thunder & Lightning. For two days the heavens have opened and a deluge has fallen. Great clouds piled above each other tower into the sky. At times the rain eases and even stops momentarily. Then above the forest more dark clouds rise, bearing the next downpour. Tracks run with water and normally dry grassy ground oozes with water. At times thunder and lightning have added to the drama. For several hours yesterday evening the thunder circled the house, now near, now far, now north, now south. Lightning flashes lit the woods. Inside the lights flickered, the radio crackled. "When I heard the storm I made haste to join it, for in storms nature always has something fine to show us"
With that thought in mind I ventured out into the damp woods, keeping away from the open meadows in case of lightning, and went swishing through the long wet grass as water dripped from the branches and everything glistened with wetness. The rich smells of damp vegetation rippled through the sodden air. The mobile, ever-changing, swirling sky spoke of impermanence and dissolution. There was a feeling of anticipation, excitement and danger. Thw world did not feel safe. Nature was not benign. "Showers will develop through Sunday turning heavy and thundery at times. Totals of 20 to 30mm are likely with isolated point totals of 50mm. Within the heavier showers 10 to 15mm may fall in a one hour period." Dark clouds, rain, lights on at noon, hills hidden, the very air grey and heavy. So far summer has been a challenge. It's easier coping with weather like this in November. Long periods of wet weather are not unusual in Highland summers but I still always hope for sun, warmth and dryness. I know what summer should be like, even if it rarely is, and I watch the weather forecasts avidly, waiting for a sign, a hint, that a walk in the high hills might be worthwhile. And at the end of last week a few days of sunshine was predicted. Free of immediate deadlines I packed for a two-night trip onto the Moine Mhor, the Great Moss, in the Western Cairngorms. This vast, high plateau is a wonderful place for wild camps and wild walks. I had last been there in the winter, building igloos and skiing in a white-out (see my blog for January 30). Walking up the path from Glen Feshie it was hard to imagine it under deep snow. I passed the headwaters of the Allt Sgurnich, where we had built the igloos, then followed this burn out into the heart of the plateau where I camped on dry turf with space and freedom all around. The night was calm, clear and surprisingly cold for July. I woke once to see faint stars in the half-dark sky. Dawn came with sudden warmth and brightness as the sun cleared the big hills to the east. The land shone in the slanting light. At a glance the Moine Mhor is a dull, grey-green land of faded grass and dark, dismal peat. Look more closely though, especially on a sunny day, and a complex world of colour and intricate details is revealed, laced with sparkling streams and deep pools. The grasses, many red-tipped, vary from emerald to olive. Amongst them grow a wealth of flowers - yellow tormentil, purple orchids, fluffy white cottongrass in boggier areas, the nodding purple petals of butterwort rising on slim stems above the roseate of sticky leaves waiting to catch midges, violets and more. The peat itself comes in many shades from a rusty red where it has started to dry out to a light-absorbing blackness where it is sticky and wet. There is life here too. A thin lonely whistle reveals a golden plover standing on a tussock. At my feet tiny frogs, newly turned from tadpoles, clamber over the ground. Surprisingly what were absent were midges. Even in the shade and at dawn and dusk I wasn't bothered by them. Packing up the camp, and with no clear idea where I would pitch my tent at the end of the day, other than it would be up high, I climbed the broad shoulder of Braeriach and then, after gazing out over the magnificent landscape of the An Garbh Choire (the rough corrie) and the Lairig Ghru pass I set off on one of the finest high level walks I know, which runs round the rim of the corrie over Sgor an Lochain Uaine to Cairn Toul. This is glorious mountain country, continuously interesting, exciting and inspiring. From the rough granite stones and boulders under your feet to the views into the great depths of the corries everything is complete and perfect. Turning away from the summits I descended into a green bowl dotted with springs, each one rich with vivid red and emerald-coloured moss. The land quivered with fresh life at the height of this short hill summer. Below I could see the ragged edges of Loch nan Stuirteag, a dark pool under the slopes of Monadh Mor. The sun, lower in the sky now, cut across the hillside under growing clouds, softening the harsh, stony mountain with a wash of subtle warmth. Above the loch a wide grassy shelf ran across the hillside, probably an ancient shoreline. Here I camped, looking out over the water to gully-riven Beinn Bhrotain. A flat boulder provided a seat and a table as I eased into the quietness of an evening in camp with only the natural world for company. As I gazed over what, for these few hours, was my domain a movement caught my eye, something pale moving on the hillside in the distance. I had seen two walkers descending that way earlier but expected them to be long gone. I peered through my binoculars and the shape snapped into focus and clarity - a reindeer. Scanning the slopes I found several more, the furthest I had ever seen them from their home in Glen More. The second night was much warmer and a gusty wind and drifting clouds greeted me in the morning. Crossing the Moine Mhor back to Glen Feshie I wandered almost aimlessly, following little burns to see where they led, skipping round pools of liquid peat, climbing onto stony little knolls to survey the landscape and investigating colourful patches of plant life around springs and seeps. A big cairn in the distance acted as a marker. As long as I headed roughly towards it I would eventually reach the path down into the outside world. There was no hurry. It was summer. The hours were long. The sun shone. This was what the hills were all about. The August issue of TGO is out now. My contributions are a review of cooking systems, including the new Jetboil Sol and the Boilerwerks Backcountry Boiler; a test report on the Sea to Summit Micro II sleeping bag; a Hill Skills piece on How to Pitch a Tent (simple for some but I frequently see badly pitched tents); a backpacking column on stealth camping and a short piece on a favourite but little known spot in the Cairngorms National Park. The last is part of a feature covering favourite spots in every UK national park. Elsewhere in the gear section John Manning reviews base layers and Cameron McNeish is very impressed with Mountain Hardwear’s new waterproof/breathable Dry Q fabric. Amongst the mass of other stuff in the new style magazine (I’m not yet used to the extra pages and larger size) Ed Byrne goes for an unusual walk with Cameron McNeish in the Monadh Liath (in which feature I’ve learned that something I’ve been doing for years and taking for granted is a skill and has a fancy name); Carey Davis visits the wonderful mountain world of arctic Norway and Dan Bailey enjoys the equally wonderful mountain world of the Fisherfield Six in the Northwest Highlands; Jim Perrin begins his series on outdoor literary classics with Alastair Borthwick’s superb Always A Little Further and Carey Davies talks to Geoff Monk of the Mountain Weather Information Service. The picture shows a stealth camp in the Eastern Cairngorms. What happens to gear you no longer use? Is there any use left for those worn-out shoes or that faded jacket? Surprisingly, stuff that may seem trash may actually have some life left. Little research has been done on this however. Until now that is. A new programme called Explore Red (Re-Use, Explore, Discover) has been set-up to research old gear and promote stuff that is still functional. Created and run by Don Gladstone, who has been involved with the outdoor industry for many years and who came up with the idea whilst paddling down the River Spey in Scotland, Explore RED will look at everything from people’s expectations of products to the social and commercial value of well-used items. The research is being carried out in collaboration with Leeds and Lancaster Universities. Gear that really is beyond use (as the shoes in the picture probably are as the sole unit has split) can sometimes be recycled but finding out about this can be difficult. The European Outdoor Group (EOG) Sustainability Working Group has been working on this and news will be released at the forthcoming Outdoor show in Friedrichshafen, which I will be attending. Reusing unwanted gear and recycling gear that really is beyond use are both good ideas but require information, encouragement and a quick and easy way of doing so is needed if they are to be taken up by many people. Hopefully, these initiatives will result in this.